Evotec AG (Frankfurt Stock Exchange: EVT, MDAX/TecDAX, ISIN: DE0005664809) and The Global Antibiotic Research and Development Partnership (“GARDP”) are today announcing the formation of a new strategic public-private partnership to tackle the growing threat of antimicrobial resistance (“AMR”). 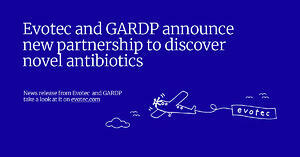 By joining forces, Evotec and GARDP will leverage their capabilities and networks to address drug-resistant bacterial infections. This includes bringing together GARDP’s clinical expertise and sustainable access commitment with Evotec’s leading drug discovery platform, expertise in medicinal chemistry and pharmacology, as well as its world-leading collection of bacterial pathogens.